Nestor Capoeira, a long-time teacher of capoeira and noted mestre (master), begins this revised edition of his bestseller with an in-depth history of the Brazilian art, giving the most popular theories for the origins and purposes of this movement that combines the grace of dance with lethal self-defense techniques in a unique game-song structure. He discusses some of the most famous capoeristas and their influence on the art. In addition, he describes how the two major branches of capoeira (Angola and Regional) came about and the differences between them. The Little Capoeira Book's clear descriptions of the game, or jogo, explain the actual application of capoeira, vaguely similar to sparring but very different in purpose and style. The music of capoeira, which is played during all jogo, is also examined, along with its main instrument, the berimbau. The author includes a how-to guide with photographs showing basic moves for beginners, with offensive and defensive applications for simple kicks, takedowns, advanced kicks and movements, head butts, hand strikes, and knee and elbow strikes. Each technique is vividly depicted with drawings that are easy to understand and learn from, and mestre capoeira includes an explanation of both Angola and Regional versions. 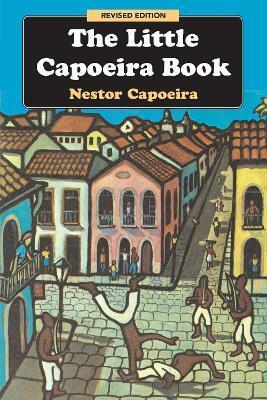 "Capoeirista, historian, sociologist, actor, author, teacher, and inquisitive traveler Nestor Capoeria presents the reader with a unique and personal vision of Capoeira. I hope all students of Capoeira will have the opportunity to use his teaching for their own growth and understanding of this art." --Bira Almeida (Mestre Acordeon) "Capoeira has been in the States for twenty years, but there are few books ... Nestor's is of interest not only to capoeiristas, but musicians, anthropologists, and lovers of Capoeira. This book will help a new generation of capoeiristas on their path." Nestor Capoeira, a man of great humor and insight, is a mestre and long-time teacher of capoeira and the author of Capoeira: Roots of the Dance-Fight-Game and A Street-Smart Song: Capoeira Philosophy and Inner Life. He was initiated by Mestre Leopoldina, a living legend. Later he joined the Senzala Group and in 1969 received the coveted "red rope," Senzala's hightest graduation. In 1990 he left Sanzala and started to teach his personal approach to the Game at his own school. He has been a pioneer in teaching capoeira in Europe, and his books have been published in Brazil, France, Denmark, Germany, and the United States, among other countries. He has worked in film, theater, and television, and currently teaches at the Planetario da Gaveae in Rio de Janeiro, Brazil.